P22 towing MV Breaksea, preventing her going aground on Tuskar Rk, March 2006. Great photos Dogwatch. Big sea there! Vessel currently on the Blocks for Iceland, though it was damaged during last years Earthquake in Chile(Being built there by ASMAR) Another RollS Royce type..
100 Tonne Bollard pull though. Coastguard officials say there has been no pollution from a cargo vessel which has run aground off the Co Galway coast. The 120 metre vessel went onto rocks in Cashla Bay in the early hours of this morning. It had arrived at Rossaveal harbour yesterday evening. The crew is still on board, and efforts will be made to refloat the vessel at high tide, which is due at about 5pm this evening. Oh Wait! We have to wait for one from the UK. Cargo Vessel Pantanal I think. Last edited by Goldie fish; 31st March 2011 at 10:24. Here's the current AIS map for the vessel. It seems she was entering the harbour to recover 2 ferries that had been seized by the bank. She is a heavy lift vessel, often used in the offshore wind farm industry to transfer towers. 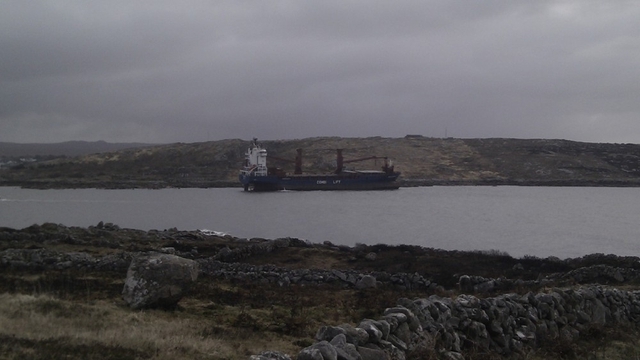 The owners of a 7,000-ton cargo ship which ran aground at Casla Bay in Connemara, Co Galway, are trying to establish it can be refloated later today. The German-owned ship, with 14 crew on board, arrived yesterday and was due to pick up two small passenger ferries at Rossaveal Harbour. The two boats had been repossessed by a bank and were sold in Galway last month. The 'Pantanal', which is registered in Newfoundland, Canada, ran aground in heavy seas at around 6am this morning. Efforts will be made to raise the boat when high tide comes at 5pm. These are the boats it was collecting. According to the Irish Times website, she dragged her anchor in heavy seas early this morning. Presumably she was waiting for daylight and/or high tide, before entering the port to pick up the ferries. 14 pages of discussion on the various business interests of the former owner of the ferries in question. Maybe the ship ran aground on a plastic house moulding machine? 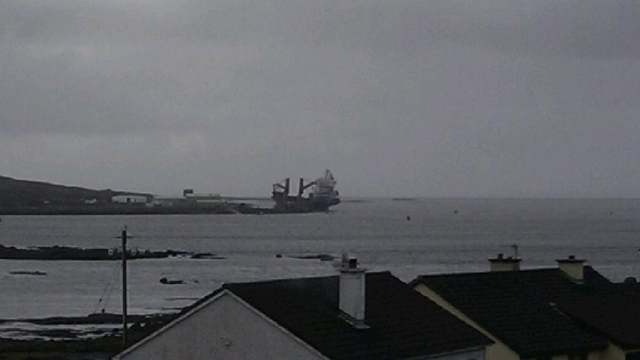 Efforts to refloat a cargo ship which ran aground off the Galway coast yesterday have been successful. The 7,000 tonne vessel got into difficulty near Rossaveal Harbour when strong winds dragged into on to rocks. A tug from Shannon helped refloat the ship at about 5.30am this morning. The owners of the boat are now examining it for possible damage. Tug from Foynes? Isn't there a tug company based there? Yeah, Celtic Isle from Foynes it seems. Normally works at Aughinish Alumina. [QUOTE=Goldie fish;331270]Anyone know whose tug? 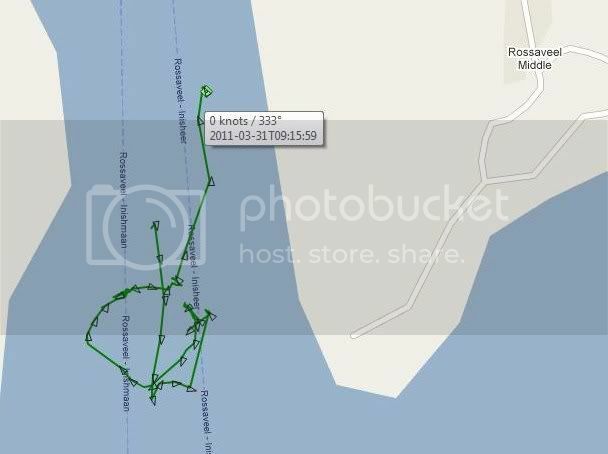 The owner is Irish Mainport Holdings Ltd.
Would have thought the OOW would have heard GPS alarm when anchor started to drag. Was on one of the ferries concerned,chatting to one of the crew,he was unaware of AIS even though he stated he was able to helm etc.Often noted the vessels do not come up on AIS poss as under 300t. More trouble with the ferries. Not the same ship, thankfully, but a similar type. Are they the same ferries though? They are the same ferries. Who thought it would be a good idea to be lifted from water onto ship by crane???? I take it the injured were not supposed to be inside the ferry as it was being lifted? Nobody should be in anything that is being lifted by crane, unless they are in a basket designed for carrying people. The cargo ship that was due to transport two passenger ferries from Galway to the Indian Ocean island of Mauritius has been placed under arrest in Galway docks this afternoon. The order detaining the 7,000-tonne Danish-registered Thor Gitta was made by the Admiralty Court. Harbour Master Brian Sheridan said he had not been informed why the ship was being detained, but it would mean the immediate suspension of any plans to transport the two ferries from Galway. Last week, three men were injured when one of the ferries fell 12 metres from a sling as it was being loaded onto the Thor Gitta in Galway Harbour. A fresh bid to move the ferries was to have been made early today but it was cancelled because of what were described as 'legal and insurance' issues. Capt Sheridan said the issues had arisen between the French company which bought the passenger ferries and the Danish cargo ship's agents. The two passenger ferries had been owned by a well-known Galway businessman but were repossessed by a bank and were sold to the French company following a public auction last month. A first attempt to transport them to Mauritius had to be abandoned when another freighter, the Pantanal, ran aground and was holed during a storm at Rossaveal. That guy Clancy must have some powerful Ju-Ju!! On a slightly seperate issue, these new legal proceedings seem to have been made by the admialty court, does anyone know how the admiralty court works, and how it fits into the Irish legal system? does anyone know how the admiralty court works, and how it fits into the Irish legal system? Its a division of the High Court and has full jurisdiction on matters arising under the Merchant Shiping Acts.Had a look at todays list and nothing is listed re Thor Gitta,order must have been made ex parte and come back before the Court early naxt week. Do we know why it has been detained?